Real Madrid manager Zinedine Zidane certainly isn’t messing around following his return to Los Blancos, the Frenchman has made some surprise changes that will shock fans. Madrid’s shock reappointment of Zidane on Monday evening sent shockwaves through the football world, the 46-year-old has signed a three-year deal until June 30, 2022 – according to Madrid’s official website. Zidane has made several changes for his first game back in charge of the Galactico’s which is against Celta Vigo. 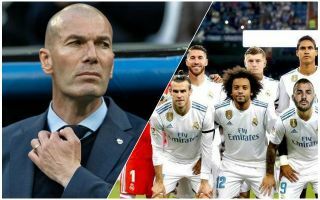 It looks as though Zizou is putting his faith into the stars that made history alongside him, by lifting the Champions League three successive times. Keylor Navas, Marcelo, Isco and Gareth Bale all return to Madrid’s starting lineup, Zidane certainly isn’t afraid of making the necessary changes to try and spark an uplift in form. One particular change that fans will be excited to see is the return of Navas in between the sticks, in the place of Thibaut Courtois. The Belgian has been extremely disappointing for Madrid since joining from Chelsea last summer. This was Zidane's XI last game in charge (CL final) last season. Anyone available to play from this XI is starting today. That's a nice gesture from him. Navas, Carvajal, Varane, Ramos, Marcelo, Modric, Casemiro, Kroos, Isco, Benzema, Bale. Finally the return of Isco! Navas, Isco, Marcelo? holy hell I love this man?? YESSS ZIDANE!!! NAVAS deserved that! Madrid’s season will end with no major silverware given that Los Blancos have been knocked out of their cup competitions and that they’re 12 points behind La Liga leaders and rivals Barcelona. Zidane’s task from now until the end of the season is to identify which of Madrid’s stars can lift a team that have been disappointing this season, the Frenchman will look to build momentum ahead of next season.